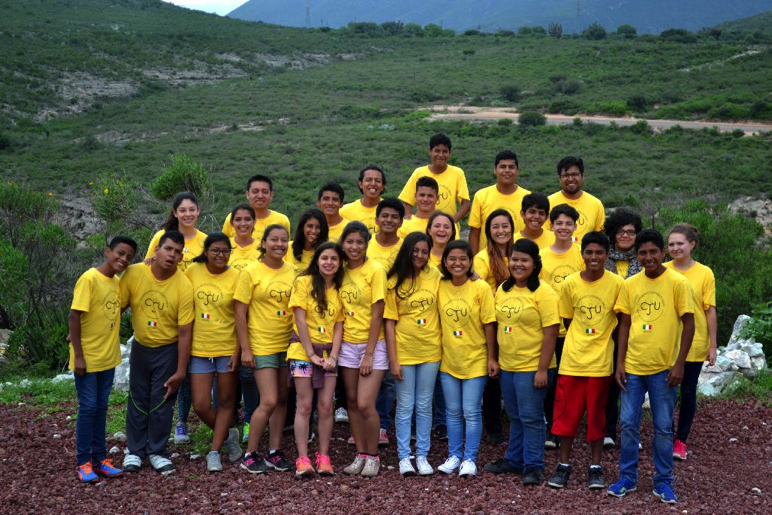 This year we had the Mexican youth camp in Ixmiquilpan, located in the state of Hidalgo, three hours from Mexico City. Campers at the youth camp in Mexico. We stayed at the Hotel Campestre, which has soccer, basketball and volleyball fields available as well as a swimming pool. We enjoyed the attendance of youth from Acapulco, Chiapas, Mexico City, Tabasco, Tepic, Veracruz and from the United States, Guatemala and Chile. The total attendance was 29 youth, six adults and two babies. We worked daily in the development of intellectual and physical knowledge and skills in a balanced way, through recreational activities and sports. We had two field trips. One was to a complex with a water park, hot springs and ziplining. The second was to Xoxafi Caverns. We ventured down 260 feet through little spaces, darkness and a circuit made by the people in charge. This was one of the highlights of camp. Also we had crafts, fun dances and a talent show with biblical role plays. This year for Christian living we used the metaphor of travel. We might only travel 2 percent of the year, and that small amount of time represents the seven days of camp we have each year. We revealed the purpose of this through sub-topics each day. The goal was to take campers on a “Journey to Freedom.” This journey is just the beginning. As a welcome the first night we had a discussion based on Acts 20:35 Acts 20:35I have showed you all things, how that so laboring you ought to support the weak, and to remember the words of the Lord Jesus, how he said, It is more blessed to give than to receive. The first part of the journey focused on frustrations. In moments of frustration we are emotionally tense and bitter. We take a positive look at this and focus on what’s necessary. We looked at the example of Paul and talked about the thorn in his flesh in 2 Corinthians 12:8-10 2 Corinthians 12:8-10 8 For this thing I sought the Lord thrice, that it might depart from me. 9 And he said to me, My grace is sufficient for you: for my strength is made perfect in weakness. Most gladly therefore will I rather glory in my infirmities, that the power of Christ may rest on me. 10 Therefore I take pleasure in infirmities, in reproaches, in necessities, in persecutions, in distresses for Christ’s sake: for when I am weak, then am I strong. The next part of our journey was focused on decisions. When decisions are made, commitments are made. Campers made the commitment to attend camp and to attend services every Sabbath and on Holy Days. We asked the question of where they stand with commitments to attend camp, to attend Sabbath services and every time they read their Bible and listen to the truths of God. These commitments lie in knowing the things of God and the responsibility they have now, as described in Luke 12:48 Luke 12:48But he that knew not, and did commit things worthy of stripes, shall be beaten with few stripes. For to whomsoever much is given, of him shall be much required: and to whom men have committed much, of him they will ask the more. With the hard hike, we took the importance of dedication in each of our goals. The effort God asks us in all we do is basically to not be mediocre people, but to be careful not to stray from the commitments of God, as Joshua 1:7-9 Joshua 1:7-9 7 Only be you strong and very courageous, that you may observe to do according to all the law, which Moses my servant commanded you: turn not from it to the right hand or to the left, that you may prosper wherever you go. 8 This book of the law shall not depart out of your mouth; but you shall meditate therein day and night, that you may observe to do according to all that is written therein: for then you shall make your way prosperous, and then you shall have good success. 9 Have not I commanded you? Be strong and of a good courage; be not afraid, neither be you dismayed: for the LORD your God is with you wherever you go. The last topic was learning through walking. As we finished the week, more emphasis was placed on the need to learn all these things by walking in His commandments, making sure they know it is their church, their God and their faith. We were on the way to finishing the journey with what God says is freedom. Friday night, campers worked in small groups, discussing their experiences and the concepts of freedom and oppression (Psalms 119:45 Psalms 119:45And I will walk at liberty: for I seek your precepts. Understanding the true meaning of freedom is embracing the concept of “being free to keep His commandments” by loving God and our neighbor. We finished camp with the Sabbath sermon on the misunderstood idea of freedom. Our lessons focused on a peaceful and responsible way of living that is full of blessings. We hope next year camp will be as successful as this one, and we invite all youth who wishes to participate to come and join us.